Besides being delicious to eat, this plant makes a handsome addition to the herbaceous border, with its silver grey thistle like leaves. The flower heads are the edible vegetable. Once it has finished flowering. •An architectural plant, suited to the back of a large border or as a feature in the garden. •Flower heads are cut before the bracts open. •Attracting Beneficial insects: If the flowers are allowed to open, they become inedible, but bees love the magnificent peacock-blue thistle flowerheads. 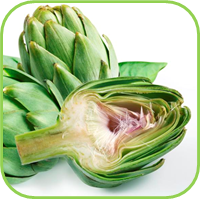 •Young leafstalks, known as artichoke chard, are blanched and eaten as a vegetable. •One of the active ingredients (Dicaffeoylquinic acids) exhibited activity against HIV integrase in vitro and prevent HIV replication in tissue culture. •Reduces blood platelet aggregation, thus suggesting a possible action in the prevention of heart disease. •Cholagogue: an agent that produces and increase the production of bile by the liver. 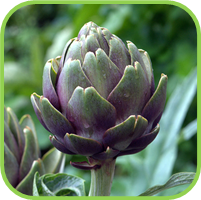 •Choleretic: Increases the flow of bile from the liver, Artichoke increases the solid bile salts as well as the liquid phase. •Cholekinetic: The ability to increase the contractive power of the bile duct. 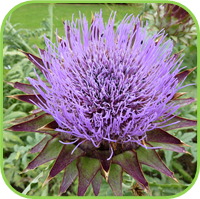 •Hepatoprotective: Protects liver from poisonous effects in a manner similar to silymarin from milk thistle by increasing the glutathione levels. •Hepatotonic: Able to stimulate the regeneration of liver cells in much the same manner as does silymarin. Useful for preventing blood and liver cholesterol elevation in the presence of toxins such as alcohol, and prevention of liver damage due to air-, water- and food-borne toxins. •Unlike other chalogogues, it may be used in cases of gallstones because it lowers cholesterol. •Treatment results in the elimination of many common complaints: epigastric discomfort, biliary tract dysfunction, dyspepsia, pain, nausea, retching etc. •Ascites (Accumulation of fluid in the abdominal cavity). • No adverse effects expected when used during pregnancy and lactation.